I am extremely emotional this week about the sun-scorched pine tree sitting on the side of my house. It’s ridiculous that I am being so dramatic about a plant, but I can’t help it. The once beautiful, small blue spruce was given to our family by my husband’s coworkers after our son was stillborn in April 2010. I loved that gift. Loved it so much that I refused to plant it near a home we don’t plan to permanently stay in. So I bought a giant pot to put it in last fall. But because I did that, it may end up dying and I might not have it anyway. The cute little tree sat on my porch all winter, spring and summer. Things were going really well until a couple of weeks ago when I noticed that the pine needles on the outer branches were turning brownish orange. I called and spoke to an expert at a local garden center who told me that the intense heat hitting my west-facing porch had probably scorched the tree. We immediately moved the poor thing to the shady north side of my house and started watering it daily. 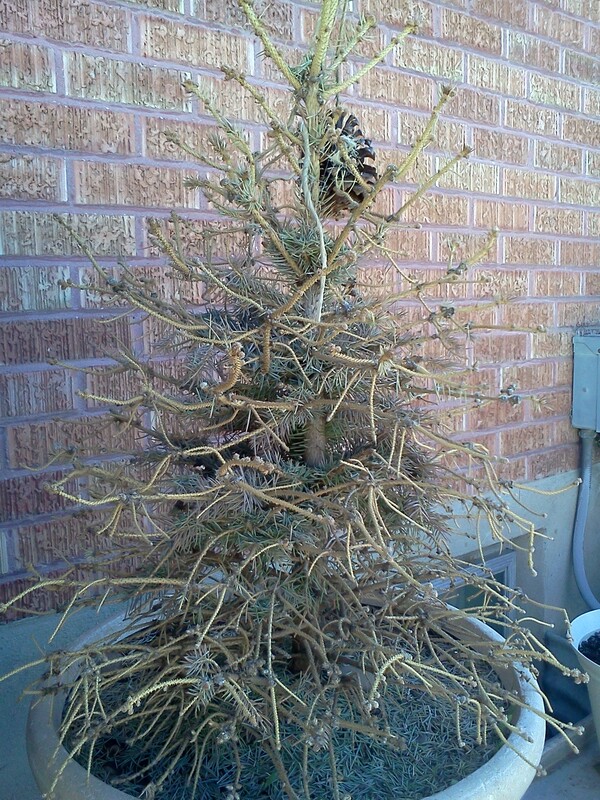 But moving the tree shook off nearly 90 percent of its dried-out decrepit needles. It is now officially the Clemens’s version of the Charlie Brown Christmas Tree. I feel horrible. Horrible that it might die because I didn’t really know how to take care of it. Horrible that I am probably going to lose one of my favorite gifts – a gift that always served as a happy reminder of my cute little Luca. Horrible that if it dies, I can never replace it. When I got it I realized I wouldn’t get to see my little boy grow up and mature, but I would always have the tree growing as a memorial to him. I guess for now there is nothing I can do. I’ll keep watering it each day until next June when there is a slim possibility that new needles will sprout from its crispy branches. It’s out of my control now. And for those of you who really know me, you’ll know how hard that is for me to accept. The hardest part will be waiting nine months to see if it lives. It reminds me of when we nearly lost our goldfish Nemo a few months ago. It was only a matter of time before he actually died. I hate death. I hate change. I wish I could walk into my boys’ room and feed Nemo each night. I wish I could see my green baby pine on my porch each time I go to check my mail. But I can’t. I know if the tree dies it really isn’t the end of the world. Believe me I’ve endured much worse. But I want it to live. I want it to grow. I want it to thrive.